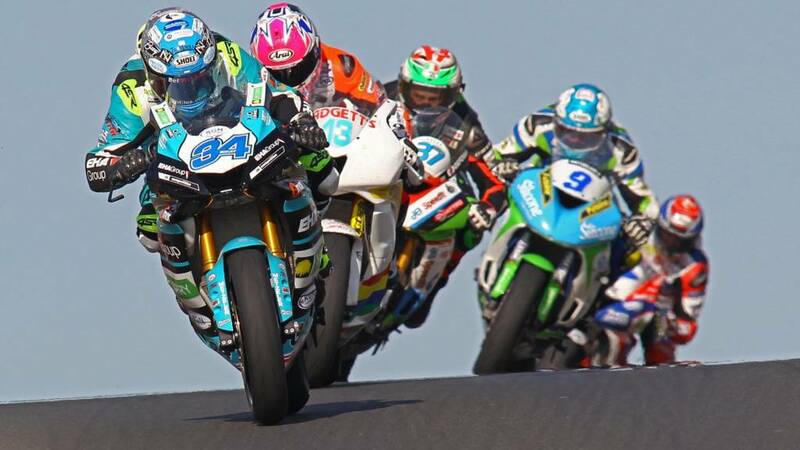 Click icon to watch or listen to BBC's coverage of the North West 200. So the curtain comes down on a terrific North West 200 meeting. Ducati rider Glenn Irwin may take the headlines by becoming the first man for 12 years to win both Superbike races. But the man of the meeting award goes to Alastair Seeley who won today's Supersport and Superstock races. So three wins overall in the meeting for 38-year-old Seeley and now has a remarkable record 24 wins at the North West. Hats off too to James Cowton who won the Supertwin races 0- his maiden North West victory. Thanks for following all the action with us. Goodbye. I'm delighted to share the podium with Michael Dunlop and Lee Johnston. I know people think there is a kind of feud between me and Michael, but I look up to him as a road racer. Hopefully we can shake hands and put that one to bed. Glenn Irwin wins the second Superbike race, dominating from start to finish. British Superbike star pulled away from a high-quality field to secure his second 'big bike' success of the day. The 28-year-old British Superbike star has won the last three Superbike races at the Triangle circuit, having taken the honours in last year's feature. It was not the exciting duel served up in 2017 by Irwin and Alastair Seeley, but the Ducati victor punches the air as he takes the applause from the fans. It is a Northern Irish 1-2-3 as Michael Dunlop is runner-up ahead of third-placed Lee Johnston. Irwin celebrates by throwing his boots into the crowd. Here's how Carrickfergus rider Alastair Seeley completed his 24th career win at the North West 200. Glenn Irwin is increasing his lead to around five seconds and looks to have this the bag. They are off the grid and again Glenn Irwin leads them into York. Coming after the Ducati man are Dean Harrison, Peter Hickman, Michael Rutter and Michael Dunlop. Starting lap two, Irwin has built up a lead of more than three seconds. Seeley is back in 11th after a bad start. Racing is halted on the opening lap after a rider crashes at Ballysally. The injured competitor is receiving medical treatment. He is taken to the local Causeway Hospital, but race organisers say the injuries are not serious. It means a delay of 20 minutes before the Superbikes gets going again for a restarted race over the full seven laps. They're off and Glenn Irwin is first to York Corner. Dean Harrison, always there or thereabouts this week, is in second as he targets a first North West win. Time for the main event of the day - the showpiece North West 200 Superbike race over seven laps. British Superbike contender Glenn Irwin won the feature last year and also took the honours in today's first Superbike race. So can we make him favourite ahead of record breaker Alastair Seeley? Ducati man Irwin should certainly be the fresher rider, having had one race today, compared to Seeley's three. The record-breaker keeps setting new standards! It is race win number 24 now for Alastair Seeley who passes Peter Hickman to win the Superstock race. Third place goes to Dean Harrison. So a third win of the meeting for the Wee Wizard from Carrickfergus. It was an exciting finish as Seeley nipped past Hickman at Juniper to claim the win. "I tried to keep them guessing which way I was going to do," said Seeley. "I went the long way round and luckily it paid off." On the last lap now, Hickman leads Seeley by half a second. Dean Harrison's Kawasaki is in third. Dan Kneen is the early leader, followed by Alastair Seeley and Michael Rutter. Peter Hickman gets his nose in front as he bids for a Superstock double. Alastair Seeley, seeking a hat-trick at the 2018 North West is also in contention. Today's penultimate race is the six-lap Supertsock contest. Peter Hickman from Lincolnshire won this class in a BMW 1-2-3 on Thursday night. Cowton takes the lead with just a few bends to go and wins Saturday's Supertwin race. A first North West victory for 26-year-old Kawasaki rider James Cowton who gets past Joey Thompson at the Juniper chicane on the last lap. Jeremy McWilliams also overtakes young Paton rider Thompson to take second. After the race on Thursday I was so disappointed. But it made me more determined. This is mega for the McAdoo team. James Cowton from Kilham in East Yorkshire has never won a race at the North West 200, but the 26-year is having a great tussle at the front with McWilliams who had wins in this class in 2013 and 2015. On the last lap, it's between McWilliams, Thompson and Cowton. James Cowton is the early leader - good starts too for Alan McLean, the evergreen Jeremy McWilliams and Martin Jessopp. McWilliams, 54, moves into the lead by the tie the bikes get to the Magic Roundabout at Ballysally. Then, on the second lap, Joey Thompson is leading from McWilliams, followed by Adam McLean, James Cowton and Martin Jessopp. After a pause in racing for World Superbike champion Jonathan Rea's parade lap, the Supertwin bikes make their way on to the grid for their four-lap contest. Glenn Irwin wins the first Superbike race at the 2018 North West 200. Dean Harrison is runner-up with third place going to Michael Rutter. After powering into a useful lead, Irwin looked in danger of being caught but then reimposed himself on the seven-lap race to win. Irwin is currently fifth in the British Superbike Championship, his best finish of the season being runner-up at Brands Hatch.